Here are some ideas for writing a creative resume. The main thing to remember is not to stifle your creativity. Let it shine, let it show, let it off the leash. Just be sure to clean up after it so everything is spelled correctly and is grammatically correct when you’re done. "My vision is to leverage creative synergies in order to offer proactive, solutions-oriented best practices, with the benchmark goal of empowering the total corporate knowledge base to a win-win situation." If nothing else, would you actually want to work somewhere that would hire a person for writing that? Go to a website like The Ridiculous Business Jargon Dictionary (www.theofficelife.com/business-jargon-dictionary-A.html) and get a great lesson in words to ban from your resume. You’re far better off heading your resume with a statement like, “I write great HTML and would like to get paid more for it” than writing tepid, managerial buzzword soup. you’re applying with. Is all their promotional material clean and spare, with lots of white space and simple fonts (like Apple)? You should keep your resume in the same design family without overtly aping their material. If you’re concerned that a firm you’re applying with may need a scannable text resume, consider enclosing a text version on plain paper along with your creative resume. If the business you’re applying with is used to creative resumes, then don’t be afraid to let loose. 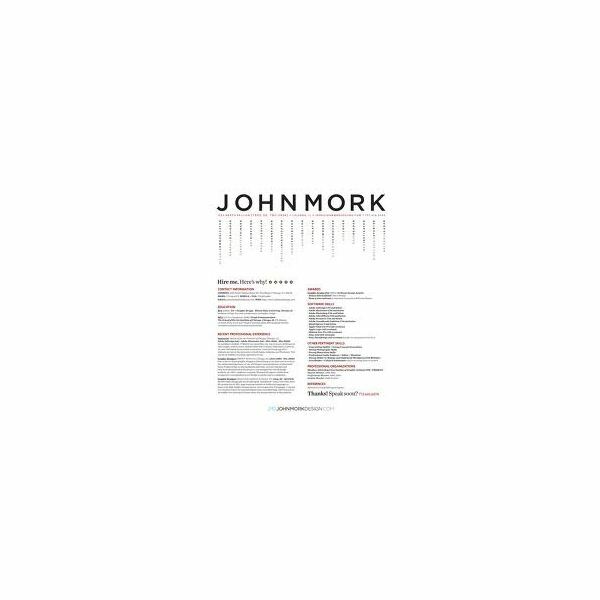 Designers have made some amazing resumes that looked like ransom notes, comic strips, magazine covers, restaurant menus, and computer monitors littered with sticky notes. The resume made to look like a desk cluttered with objects (pen, stack of papers, highlighter, coffee stain, iPod), each bearing snippets of relevant information has been done a lot. In fact, in some markets it may have been overdone, so be careful. Finally when writing a creative resume, consider the “so un-cool it’s cool” strategy. Have you ever played the card game “Hearts” and won by using the “shoot the moon” strategy? If you don’t know, that’s a strategy where you try to collect rather than get rid of all the penalty cards, and if you’re successful, you win. It’s certainly risky, but if you know a firm is going to get inundated with resumes that are art projects and you submit a standard, business-like resume, it will stand out. You must include links to your portfolio or other relevant creative matter at or near the beginning, so they can have a look at your bona fides, but other than that you would keep to standard resume format. You probably don’t want to stake your dream job on this strategy, but in some cases, it might be worth taking a chance.